As we round the corner to a new year, I am especially excited about one thing in particular that’s on my calendar for 2018. 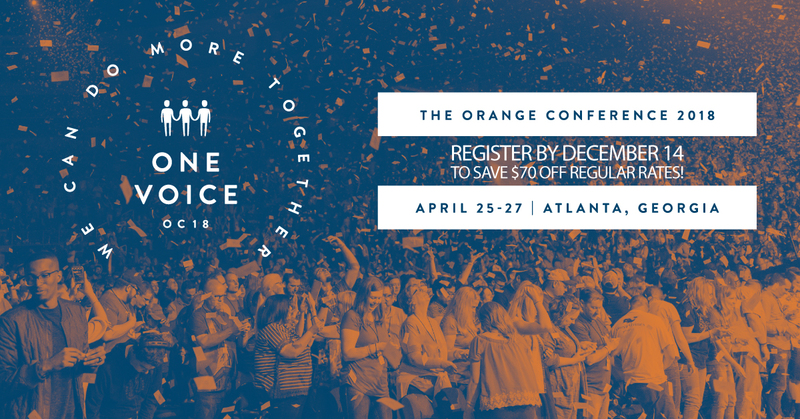 THE ORANGE CONFERENCE happening April 25-27 in Atlanta, GA! This week, you can save $70 if you register for the Orange Conference by December 14th! Each year, the number of attendees grows and last year I believe there were over 7,000 people at #OC17. But somehow, it feels like I’m attending a huge family reunion. It’s great to reconnect with people I have met through social media or at the conference in year’s past. I love getting to catch up and find out what is happening in their lives and ministries. And the idea of 1000’s of people coming together around one common purpose – to win with the next generation as we lead them to follow Jesus – is just amazing! The Orange Conference is held each year at the Infinite ENERGY Arena in Duluth, GA. I find that ironic because the energy at the Orange Conference is beyond measure. There is an excitement that comes with being around 7,000 people all worshipping, laughing, and sometimes crying together as main sessions inspire and break-outs encourage. It fills up my tank and while I’m tired by Friday, I am energized to go home and apply all I’ve learned. Getting away from our routine is always good for the soul, but when you can get away and be inspired by some of the most talented, creative, productive people on the planet, it’s even better. It is so refreshing to have the opportunity to step away from my responsibilities for a while. To take a small break from being the one that serves each Sunday (and throughout the week) and instead have others pour into me, teach me, and care for me. For the 3 days of Orange Conference, I don’t have to worry about if Pro Presenter is going to work, if I have enough volunteers to run Sunday morning, or if the supplies got put into the proper bins. I just get to “sit and soak” a bit. Each week, Sunday is coming and while I love to dream and think about what “could be” for my ministry, life happens, time slips away, and I find myself (more often than not) in the everyday routine of life – preparing for what’s right in front of me or coming up next. At the Orange Conference, I get to step back and think about my ministry from the “30,000 foot” view. I am inspired to dream and hope and ask God about all that He has for me in this work He has entrusted to my care. Of course, I learn so much at the Orange Conference each year. I have tons of notebooks, word documents, and notes on my phone – all full of incredible information that helps me as grow as a ministry leader and as a follower of Jesus. I always learn personally as well as professionally at the Orange Conference. God uses the Orange Conference every year to challenge me in the best of ways! Some years, I’m challenged to make changes in my leadership. Some years, I’m challenged to think through the way we are doing something in our ministry and some years (like #OC17) I am challenged personally. Actually, every year I’m challenged in all of these areas, but some stand out more than others. Regardless, every year I head home with a list of things I want to see happen or change in my ministry or in myself. The leaders of Orange are some of the most creative people on the planet in my opinion. From the environments they create, to the themes they carry throughout the entire experience, to the way they weave it all together to teach, encourage and inspire, I am always amazed what they come up with. Just when I think they can’t top last year’s conference – they come along and blow me away with their newest ideas and innovative programs. As someone who loves to create, this is one of my favorite aspects of the Orange Conference each year. The Orange Conference is definitely a place where I am challenged and where I learn and grow a lot, but it is also a place where I have a ton of fun! There is so much laughter and the opportunity to play, gather with my team, and eat flavors of popcorn I’ve never even heard of before, create a fun atmosphere and an experience that is memorable each year. If you register for the Orange Conference, we can meet up! I’d love to meet you, share a cup of coffee and find out what you have going on in your ministry. So, if you’re going to #OC18 be sure to let me know and we can #hangout!